October 1931. 12 hp Saloon. Invicta is a British automobile manufacturer. The brand has been available intermittently through successive decades. Initially, the manufacturer was based in Cobham, Surrey, England from 1925 to 1933, then in Chelsea, London, England from 1933 to 1938 and finally in Virginia Water, Surrey, England from 1946 to 1950. The company was founded by Noel Macklin with Oliver Lyle of the sugar family providing finance, with assembly taking place in Macklin's garage at his home at Fairmile, Cobham, Surrey. The cars were designed to combine flexibility, the ability to accelerate from virtual standstill in top gear, with sporting performance. The first car, the 1925 2.5 litre used a Meadows straight six, overhead valve engine and four speed gearbox in a chassis with semi elliptical springs all round cost from £595. The engine grew to 3 litres in 1926 and when production of the model finished in 1929 about 200 had been made. A larger engine, still by Meadows, was used in the William Watson designed 1928 4.5 litre available in short (118 inch) or long (126 inch) versions and also high Type A and low Type B chassis. 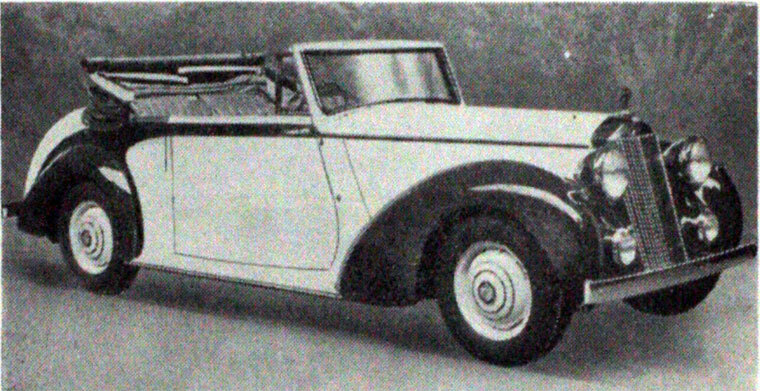 The sporting low chassis was arranged by using under-slung rear springs. About 500 were made up to 1934 which was quite a lot considering the high price. The long wheelbase NLC luxury model could cost up to £1,800. In an attempt to widen the market appeal the 1.5 litre straight six overhead cam [Blackburne engined 12/45 was announced in 1932. It was a large car with its 118 inch wheelbase and proved too heavy for the available power needing a 6:1 rear axle ratio. It was available with a pre-selector gearbox as an option. The supercharged 12/90 of 1933 increased the available power from 45 to 90bhp but few were made and a proposed twin cam 12/100 never got beyond a prototype. Sporting success came with Invictas driven by Violet Cordery, who was Noel Macklin's sister in law, and gained the Dewar Trophy for reliability in 1929 and 1931, Sammy Davis, who had a spectacular accident in one at Brooklands in 1931 and Donald Healey who in 1930 gained a class win and in 1931 a first in the Monte Carlo Rally. Car production seems to have finished in 1935. An attempted revival using Delage and Darracq components failed to get off the ground. 1933 Noel Macklin founded Railton Cars who used the Cobham buildings to make their cars after Invicta moved to Chelsea in 1933. The company was reformed in 1946 operating from Virginia Water to make the Black Prince. Meadows engines were again used, this time a twin overhead camshaft 3 litre six giving 120 bhp. The cars were extremely complex and very expensive with Brockhouse hydro-kinetic variable ratio "gearbox", full independent suspension using torsion bars, and built in electric jacks. About 16 were made. The new company lasted until 1950 when it was bought by Frazer-Nash makers, A. F. N.. This page was last edited on 15 April 2019, at 08:41.